PIA District Lobbying Day... Capitol Hill In Your Backyard! PIA's fifth annual Political Involvement and Advocacy Month has drawn to a successful close as Congress is set to reconvene. Agents across the country met with their Representatives and Senators, as well as with candidates for Congress in the fall elections. During this year's August meetings, PIA members nationwide used this opportunity to meet with their elected officials in their districts to discuss issues pertinent to our industry including support for a five-year extension of the National Flood Insurance Program (NFIP); natural catastrophe legislation; crop insurance; producer licensing; and PIA's steadfast opposition to federal insurance regulation, including a so-called optional federal charter for insurers and producers. As in previous years, PIA of Louisiana members stepped up and spoke out on behalf of our association to make Political Involvement and Advocacy Month a success once again. 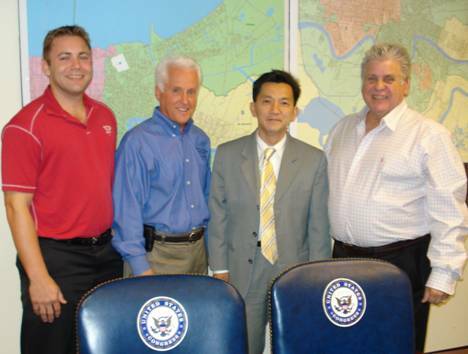 "We had some very productive meetings with our members of Congress," said Gene Galligan, 2010-2011 President-elect of PIA of Louisiana. 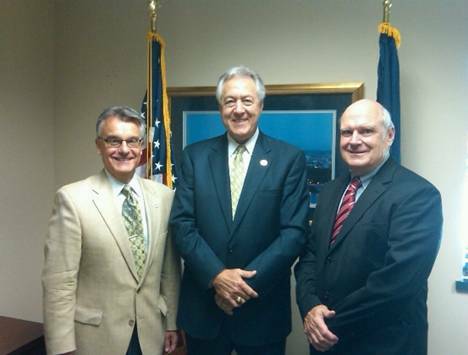 Galligan and past PIA of Louisiana Board member Barry White met on August 26 with Rep. Rodney Alexander (R-La.). "Our lawmakers were very sympathetic and responsive to the concerns of PIA." PIA Members Bring Capitol Hill to Their Backyards. PIA of Louisiana President-elect Gene Galligan of Monroe, Louisiana (left) with Rep. Rodney Alexander (R-La.) (center) and past PIA of Louisiana Board member Barry White. PIA of Louisiana was represented in other district meetings as well. PIA of Louisiana Secretary-Treasurer Manuel DePascual (Alliance Insurance Agency, Metairie) and Board Member David "Moose" Bulloch (Speed - Stiel Insurance Services, Hammond) met with Representative Steve Scalise (R-La, 1st District); PIA of Louisiana Past Presidents Dale Spaht (Fife-Spaht-Carmouche Insurance Agency, Gonzales) and Jared "Butsy" Martin (G. Martin Insurance, Lutcher) met with Representative Charlie Melancon (D-La, 3rd District); and Don Fearn (Mid - City Insurance Agency, New Orleans), Pat LeBoeuf and Board Member Patrick LeBoeuf (both of Pat LeBoeuf Insurance, Westwego) met with Congressman Cao (R-La, 2nd District). A major push will be made next year by advocates of federal insurance regulation to get Congress to enact an optional federal charter. PIA is adamantly opposed to optional federal charters and to any federal encroachment on the right of states to regulate insurance. PIA members reminded members of Congress and congressional candidates during their August meetings that America's Main Street insurance agents expect them to vote "no" on the so-called optional federal charter — no excuses and no compromises. To learn more about PIA's Issues of Focus please visit National's website at www.pianet.com. The issues facing professional insurance agents today require PIA members to inform Congress of the challenges and realities of the growing number of congressional insurance proposals, and we thank our members for making PIA's voice heard!